Seattle's Central District has always had an active community, but it has changed significantly with the city's growth spurts. The recent demolition of the Promenade Plaza on Jackson Street and 23rd Avenue was seen as the end of an era by many longtime residents. And when the large, mixed-use complex on that site is completed, the neighborhood will surely change even more dramatically. In spite of all the activity along Jackson Street, relatively few people in Seattle check out this part of the Central District. Perhaps it’s because if they think of Jackson Street, they think first of all the great shops and restaurants along it in the International District. Perhaps it’s because they stick to the other main drags in the Central District, especially Union Street, heading all the way east into Madrona. Or maybe it’s because they just don’t know much about this part of town, besides Pratt Arts Center, which is itself going through major changes with a large mixed-use building going up on the site of its administrative offices. If you haven’t explored this part of the Central District, we’re here to introduce you to some of its hidden gems. Tucked in a plaza with old school signage by the road, Moonlight Cafe is an unassuming spot that many people might pass by. It is right across the street from Pratt (and the mural in the featured image, which was designed for Pratt by mural artist Derek Wu.) But don’t you make the mistake and pass this spot by if you like casual Vietnamese dining. Moonlight Cafe’s extensive vegetarian and vegan options really set them apart from other Vietnamese restaurants. Their meatless options will satisfy even self-described carnivores. That said, beef lovers will drool over their tender, perfectly sauteed Shaking Beef (Bo Luc Lac). The prices are reasonable, and the portions are generous, so come with an appetite, eat family-style with your friends, and leave with leftovers. Those with soy allergies should avoid this spot. Everyone else, however, should try it. Northwest Tofu Company is next door to Moonlight Cafe and another great spot for vegans and vegetarians, naturally. The menu is inspired by Taiwanese comfort foods. Again, expect big portions for a little dough. And don’t expect any frills either. It’s very much a hole in the wall that a lot of people might even be a little afraid to try. (The outside is really dumpy.) Come for breakfast or lunch, as they open at 7 am and close at 5 pm sharp. If you love seafood, then you have to try Seattle Fish Guys just around the corner from Jackson Street on 23rd Ave (and right next door to our newest listing below). Their counter sells fresh fish by the pound to take home, but you can also eat in at one of their little window-side tables. We recommend it, but we can’t pick just one item from the menu to recommend. Scallop poke bowls? O M G, so yummy. Smoke salmon trio plate with a baguette? Oy, what an irresistible nosh. And the toasted crab sub? All the crab deliciousness and the only thing crackling is that crispy baguette! We recommended Reckless Noodle in a post last fall about cocktail spots in and around the Central District. Here, we recommend it more explicitly based on the food (but the cocktails are great, too). It’s definitely the hippest, most mod spot on this list, too. (And a GREAT happy hour to boot.) The name may say “noodle,” but there is much more to the menu, including a rich 5-spice duck confit and ribeye steak strips grilled in betel leaves. And the name may say “reckless,” but for a cozy, spicy dinner date, it’s a safe bet. The west end of this strip, you hit the boundaries of Squire Park, a district comprising parts of First Hill and the Central District. 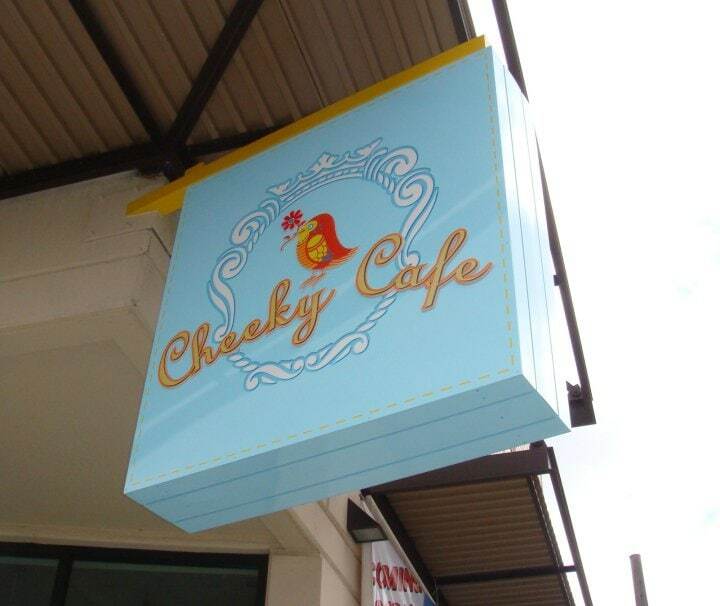 And there, in the Squire Park Plaza apartment building on Jackson, you’ll find Cheeky Cafe. The vibe here is upbeat, homey, clean and simple. They serve classic breakfast all day, as well as American and Asian comfort food…often with a twist. Mac and cheese with kimchi is a popular option, as is the Cheeky French Toast, which comes stuffed with your choice of bananas, blueberries, peanut butter or chocolate. They sometimes offer other fillings, too, such as lemon curd and fresh seasonal berries. In short, this is not the place to go when you are on a keto diet. Make the leap into home ownership or investment properties with our simple, affordable condo at the Welch Plaza. 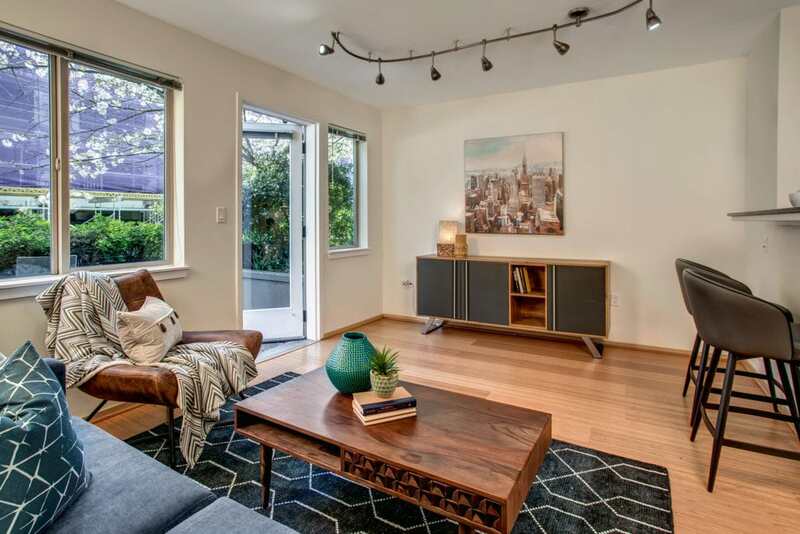 Complete with updated kitchen, spacious patio, bamboo floors, and a dedicated parking spot. Not only are you centrally located from all of the delicious nibbles we just recommended, but multiple parks are also minutes away including Pratt Park and the Judkins Park and Playfield. Leave your car parked and get around on public transit that is readily available, connecting you to both the International District and Beacon Hill light rail stations. Enjoy a tour and a nibble in this diverse Seattle neighborhood.